The aliens listed in the L-CARS database have been arranged alphabetically. First encountered in 2373. While on their planet, Lieutenant Paris and Ensign Kim were wrongfully accused for terrorist activity and sent to a prison ship. Janeway then had to convince the party responsible for the terrorist activity, a group known as "Open Sky", to help them locate her missing crew members. A species which was encountered in 2375 which was searching for a new energy source to fuel their fading empire. Their research led them to discover and create the Omega Molecule, a very powerful and dangerous particle. The Omega Molecule had been responsible for killing a Federation science team in the Alpha Quadrant, as well as destroying subspace so that warp drive could not be used. For this reason, the Federation implemented an Omega Directive where any Federation ship which encounters the molecule is to destroy it at all cost. The Federation feared the particle landing in the wrong hands, which could lead to a very powerful weapon to be built. Due to the Omega Directive, Captain Janeway broke the Prime Directive and destroyed the Omega Molecules created by the Allos scientists, thus leaving them to discover an alternative energy source. In 2372, Captain Janeway led an away team to an Alsaurian City to make a trade for a vital warp core component. Just as the deal was made however, Mokra soldiers, who dominate over the Alsaurians, tried to stop the away mission. Captain Janeway was left behind after being shot, and was taken care by an older Alsaurian, Caylem, who believed Janeway was his daughter. First encountered in 2374. He created a ship that resembled a Starfleet ship in hopes to punish Captain Janeway and her crew by sending them to Borg space. He was seeking revenge for his people's assimilation by the Borg after Janeway had helped the Borg defeat Species 8472. Arturis believed that if Janeway hadn't interefered, his species would still be free. The Benaens were first encountered in 2371. Lieutenant Paris and Ensign Kim were sent to their planet to seek aid with some of their malfunctioning technology. A scientist helped them, but soon Paris was accused of murder. The Benaens use memory engrams of the victim which are planted into the minds of the murderer to punish them. Therefore, Paris had to suffer reliving a crime he did not commit over and over again. Lieutenant Tuvok, after investigating the events, discovered that the engrams contained a code, and that the Numeri were attempting to kidnap Paris so they could receive the code, which was for various Benaen technology, that Tolen Ren (the scientist who was murdered) was working on. It should be noted that the Benari and the Numeri were at war, and that the Benaens were the peaceful species of the two. A species encountered in 2374. They would not let Voyager pass through their space, even though Captain Janeway declared she had no hostile intentions. The only way the Bomar would allow Voyager to pass through their space was if they took a course plotted by them-- which was longer than the passage around Bomar space. When Seven of Nine escaped from Voyager, she entered Bomar space after believing she was being summoned by the Borg. The Bomar then proceeded to follow her Shuttle with the purpose of destroying it. In 2363 in the Neutral Zone, several Federation and Romulan colonies were "sucked" off the surface. At the time, it was unknown how this occurred, and who was responsible. However, it is now believed that the perpetrator of these bizarre attacks on the colonies were a species known as the Borg. Starfleet first encountered the Borg in the year 2365 when the alien Q flung the USS Enterprise D and her crew to system J-25 in the Delta Quadrant. An El-Aurian aboard, Guinan, was able to relay her experiences with the Borg to Captain Picard, warning him of the threat that they posed. Captain Picard listened to her warnings, but still sent an away team to explore the Borg ship. Upon arrival, they discovered a species of cyber-netic beings- they were half machine, half humanoid. The Borg did not respond to their presence, not considering them a threat. The Borg travel in a massive cube-like ship. There is no Bridge, no command center on board a Borg ship. The Borg merely work together, since all Borg are linked in a massive Collective. This Collective allows them to efficiently carry out tasks on a grand scale. The Enterprise crew also discovered that the Borg weren't interested in them, just their technology. Upon damaging the Borg cube, it merely regenerated. This first encounter better prepared them for the future Borg threats that the Federation would have to face. In 2366 the Borg once again returned, this time on a direct course to Earth. The Enterprise was once again sent to intercept, since they had experience fighting this powerful enemy. In the process, Captain Picard was kidnapped, and assimilated by the Borg, in the hope of creating a human link between the Borg and humanoids, a voice. In 2368 the Enterprise once again encountered the Borg, in the form of a Borg scout ship. In the end, they returned a Borg, who they designated Hugh, into the Collective with thoughts and emotions. This caused chaos, and a new breed of Borg were created. Commander Data's brother, Lore, then took this opportunity to guide these confused Borg (they were detached from the Collective in the first time of their lives). Luckily, the Enterprise crew were able to stop them. Assimilation occurs when the Borg inject hundreds of Borg nanoprobes using injection tubules into the victim. The Nanoprobes quickly attack the victim's red blood cells, and slowly take over. The nanoprobes then work together, replicate, and create Borg implants on the individual. The Borg are un-emotional, cold, but efficient. They value efficiency above all else. In order to increase their knowledge, the Borg must assimilate -- they do not learn. By assimilating new cultures, they gain their experiences, technology. The Borg can then incorporate this into their species. Their goal -- to better species through assimilation. The USS Voyager first encountered the Borg in 2373 when they found a drifting Borg cube in the Nekrid Expanse. Captain Janeway then ordered an autopsy on a Borg drone as to better know their enemy, since this was the first time such an opportunity had presented itself. Under normal circumstances, a deactivated Borg Drone dematerializes, which did not allow for much study into their functioning. Commander Chakotay then discovered a community of detached Borg from the Collective. They wished to re-establish a Collective amongst themselves to bring together their minds as one, allowing to stop fighting among the various sects. Chakotay aided them by re-activating the Borg cube. The new community of Borg then used their connection with the Collective to destroy the Borg cube. Although it is unknown how these new Borg will evolve, Commander Chakotay believes they will not be a threat. Later in 2373 Voyager encountered the Borg again when a probe was intercepted by the Borg. Janeway took the event as being quite serious, since it was very unlikely one ship could survive the passage through Borg space. However, they did detect a narrow passage of space, devoid of Borg activity. The reason for this in-activity: Species 8472 which was attacking and slowing destroying the Borg Collective. Captain Janeway then decided the best course of action would be to make an alliance with the Borg, to help them destroy species 8472, but the Borg would have to allow Voyager safe passage. A single Borg was then created, designated Seven of Nine to act as a voice between Janeway and the Borg as they worked together to create a nanoprobe weapon which could stop 8472. Eventually a weapon was created, and several 8472 ships were destroyed, sending a message to the hostile aliens. They immediately returned to their fluidic space. However, the Borg went against their agreement with Janeway and Seven of Nine attempted to transmit Voyager's co-ordinates to the Borg so that the ship could be assimilated. Janeway was ready for this possibility and the threat was extinguished after Commander Chakotay used his experiences with the detached Borg Collective several months earlier to distract Seven of Nine while Lieutenant Torres overloaded Seven's connection with the Collective. Although Voyager is out of Borg space thanks to Kes, Janeway still fears a future encounter with this unstoppable threat. Voyager had several more encounters with this threat, including an encounter with the Borg Queen herself, the mind of the Collective, which wished to use Seven of Nine's knowlege of humanity to assimilate the Federation. Voyager also managed to create a 29th century Borg when Seven of Nine's nanoprobes and the EMH's holo emitter fused together. In 2372, Voyager was passing through an area of space belonging to the Botha. Captain Janeway was prepared for diplomatics to allow them to continue through Botha space, however, they never truly met the Botha. One of the Botha used his telepathic abilities to lock the crew in various catatonic states. In most instances, a crewmember just began to hallucinate. Both Kes and the Doctor were able to stop the threat, by using a burst from the Warp Core to disrupt the telepathic field. One Botha male was revealed, but he soon disappeared, leaving the crew with many unanswered questions. In the Earth year 1937, the Briori traveled to the Alpha Quadrant and to Earth and kidnapped several humanoids and returned them to the Delta Quadrant. One such noted figure included Amelia Earhart. On their planet, the Briori forced other species to work for them. One day the species revolted, and the Briori fled and were never seen again. First encountered in 2374. When they were first encountered, they seemed peaceful. Their race was in tatters after being almost entirely assimilated by the Borg. Janeway was willing to help a small fleet of Caatati ships. Soon however, the Caatati returned with more ships in the hope of either taking Voyager, or taking Seven of Nine (seeking revenge on the Borg). Janeway was not willing to give up Seven of Nine to the Caatati, but that was un-necessary since Seven announced she could develop a device which could manufacture the type of molecules that the Caatati ships needed to operate. The Caatati agreed, and returned Voyager's ejected warp core (they had taken it while Lieutenant Paris and Torres attempted to retrieve it after a Transwarp test went awry). Although the Federation has been in contact with the Cardassians for many years, Voyager encountered a Cardassian that they had believed to be a Bajoran. Seska, a former Maquis, was found to be a Cardassian spy. She was able to flee the ship and avoid capture, and joined the Kazon to help them attempt to take-over Voyager. She used many elaborate plans in attempting to capture Voyager, one where she claimed to have Commander Chakotay's baby. In the end, after she and Maj Cullah had taken Voyager in 2372, she died when Lieutenant Paris, the Doctor and several Talaxian ships were able to overload Voyager's Phaser couplings. Voyager also encountered a piece of Cardassian technology in 2373 when a Cardassian missile was on a direct course to the Rakosian homeworld. 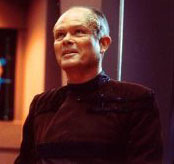 The Caretaker was responsible for pulling Voyager to the Delta Quadrant, from the Badlands. His people, who are sporocystine creatures had damaged the Ocampan homeworld, which resulted in the Ocampans having to live underground; so he was assigned to guard over and take care of the Ocampan people. When he began to die, he started pulling ships from all over the Galaxy, searching for a compatible race whereby he could create a new Caretaker being to watch over the Ocampans. When he did die, Janeway destroyed his powerful array, which was Voyager's only way home, to prevent the Kazon from using the Array to destroy the Ocampans. Voyager then encountered the Caretaker's mate, Sesperia in 2372. She was hostile and angry over her mates death, since she believed Voyager was responsible. She attempted to destroy Voyager, but Janeway was able to convince her that Voyager wasn't responsible for her mate's death -- he simply died from natural causes. Sesperia then vanished, and has not been encountered again. First encountered in 2371. It was believed that the cloud creature was a nebula which contained vast amounts of a power source that Voyager could use. After Voyager began to hurt the creature by penetrating various membranes and firing torpedoes on it, the creature reacted. The reaction damaged many systems and left Voyager adrift. Fearing that she would further hurt the creature by activating engines, Janeway used a type of circulatory system the creature had to return closer to the exterior of the cloud creature.. Voyager was then able to safely exit the cloud, without further damaging the creature. The Cravic beings were first encountered in 2372. They were a race made up of robots, who were at war with the Pralor. Although the Cravic were not hostile towards Voyager, they were aggressive towards their enemy, the Pralor. The dispute between the Cravic and the Pralor was wiping out both races since the robots were unable to reproduce, due to modifications by their ancient makers. The Deuterium species were discovered on a Demon Class (Y) planet in 2375 when Voyager was forced to land to find Deuterium to power the ships systems, as Voyager was running dangerously low after being stranded in the Delta Quadrant for five years. The species had never had sentience until they duplicated Ensign Harry Kim and Lieutenant Paris. The duplicates could only survive in the atmospheric conditions on the Demon Class Planet. The aliens wished to duplicate the entire ship and crew, and they came to an agreement with Captain Janeway whereby the crew allowed themselves to be duplicated to create a new Voyager crew that would exist on the Demon Class planet in return for deuterium to power Voyager's systems to reach home. In 2376, when responding to a distress signal, Voyager found traces of Deuterium and other elements similar to the Deuterium species in space. Their origin was unknown. The Devore, a species encountered in 2375, are telepathic patrollers. Their race fears telepaths due to their mindreading abilities. Therefore, the Devore Imperium has an objective to eliminate all telepaths. As Voyager passed through their space, they were subject to numerous inspections whereby the telepathic crewmembers aboard Voyager, including Commander Tuvok, had to be concealed using the transporter. Voyager assisted in freeing several telepaths using a wormhole to allow them to escape Devore space, and thus persecution by the Devore. The Drayans were first encountered in 2373. What made their species so unique was the fact that they aged in reverse to how humans aged. The oldest of their species appeared to be merely children, whereas the youngest of their species appeared to be quite old. Lieutenant Tuvok crashed a Shuttle on one of their moons where dying Drayans are sent to die in peace. Tuvok believed they were children who were stranded on the moon, and wanted to take them off the moon. The Drayans were furious since the moon was sacred, the children were sent there in a specific ritual so that they could die. Eventually, Voyager learned of this reverse aging process, and the children were left to die on the moon, as they originally intended to. First encountered in 2374. They attempted to place the entire crew in a dream state, since these aliens existed in the dream world. Commander Chakotay(using his known techniques of the dream world from his many meditations) and the Doctor were able to stop this process, and wake the crew up. First encountered in 2373. They assisted Voyager by giving them new technology to help Voyager on its way. An older Enaran woman transferred her memories to B'Elanna Torres in the hope of the truth of a dark secret of her race to come forward, a truth which had been buried for many years. This truth-- that her species had been involved in a Holocaust to completely wipe out another race, known to them as 'Regressives'. Although the Enarans did not believe B'Elanna's claims, she proceeded to (with the help of another Enaran) to transfer the same memories of the Holocaust to another Enaran woman who promised to reveal the truth to her people. Two Ferengi from the Alpha Quadrant who travelled to the Delta Quadrant by the Barzan wormhole were encountered in 2372. They had went to a primitive planet and became demi-gods, since these people believed they were the Sages. The two Ferengi men enjoyed extreme wealth until Janeway stopped the Ferengi by taking them back to their ship, and sending them through the wormhole. However, the wormhole collapsed before Voyager could enter it. The Ferengi were first encountered by Starfleet in 2363. At first, the Ferengi were devious and deceptive, in the hopes of stealing peoples technology. They tend to lie quite frequently, but in recent years, the Ferengi and the Federation have been able to peacefully co-operate with one another. The Haakonians are a species who were at war for many years with the Talaxian race. In 2371, Neelix came face to face with Jetrel, the man responsible for building the weapon which destroyed his homeworld Rinax, and also his entire family. Neelix survived the disaster since he was not on the homeworld at the time. A very primitive race encountered in 2372 on the planet Hanon 3. Voyager's crew had been sent to Hanon 3 by the Kazon after Maj Cullah and Seska had managed to take over Voyager. At first, the Hanonians were slightly hostile towards Voyager's crew. They kidnapped Neelix and Kes, however, relations between the Hanonians and Voyager's crew became peaceful again when Chakotay saved one of the Hanonians from a lava flow. Later, one of the Hanonians saved Ensign Wildman's baby using herbs and other ancient techniques. A species encountered in 2376, hired by the Think Tank to attack and capture Voyager, so that the Think Tank could manipulate Voyager into giving up Seven of Nine to solve the "Hazari Paradox". When Captain Janeway discovered the centrifuge, she exposed it to the Hazari, and the Hazari and Voyager worked together to stop the Think Tank. The Hierarchy (the Overlookers) were encountered in 2375. They are a species who spy on other unsuspecting vessels in order to determine if they have any technology which is of value. The Hierarchy observed Voyager for quite some time, but were unknowingly observing the daydreams of the Doctor. Voyager first encountered the Hirogen in 2374 after stubbling about a network of arrays which the Hirogen had claimed. Voyager used these arrays to communicate with the Alpha Quadrant, before the conflict with the Hirogen caused their destruction. The Hirogen are a hostile, powerful and aggressive species. They live and thrieve for the hunt, and this hunt consumes their lives. They travel in packs, like wolves, and there doesn't appear to be one ruling power which directs the functioning of the Hirogen. Once the Hirogen have chosen their prey, they do not stop until they have capture this prey. Once they have captured it, they display it, like trophies. They also use the remains of their prey for a source of food. The deadliest encounter with the Hirogen came when they managed to take-over Voyager. They then placed the crew in various Holodeck simulations, so they could hunt them, injure them, send them to Sickbay to be healed, and then send back to the Holodeck to be hunted again. The Hirogen used a device to ensure that the Voyager crew did not remember who they were, so they would participate in the hunt on the Holodeck. The Doctor was able to disrupt the Seven of Nine's memory blocking device, and as a result, she was aware of who she was, and what was going on. Captain Janeway also had her device interrupted, and she and Seven (plus crew members who still believed they were holodeck characters) were able to fight the Hirogen as the battlefield was extended to the entire ship since Holodeck emitters were on every deck. In the end, Ensign Kim was able to overload the Holodeck, thus stopping the program. To end the dispute, Captain Janeway gave the Hirogen hunters a Holodeck generator. It was believed that the Hirogen species were in a downworld spiral, and the Holodeck fighting would serve to strengthen the species and ensure their survival. The Hirogen have not been seen since, as Voyager has passed through their space. Voyager first encountered the Ilirians in 2373 when one of them, a man named Tieran, took over Kes' body. Kes/Tieran then proceded to their homeworld to reign over the throne after assassinated the current rulers. Voyager first encountered the Kazon after arriving in the Delta Quadrant in 2371. They quickly learned that the Kazon were a very hostile, aggressive species. The Kazon exist in many separate sects (such as the Ogla, the Nistrim). Sometimes these sects work together, but most of the time they fight amongst one another. Many years ago, the Kazon were held captive and were prisoners of the Trabe. These events on Trabe worlds led to the aggressive nature of the Kazon. Eventually, the Kazon overthrew the Trabe, and took-over many of their planets and stole their ships. The Kazon sects have one purpose -- to sustain themselves, whatever way possible. Since they do not have replicator technology and water is scarse, nor do they have transporters, the Kazon constantly stalked Voyager, looking for an opportunity to steal Voyager's valuable technology. Captain Janeway was un-willing to give up this technology, since it would violate the prime directive, since it would significantly alter the balance of power in the Delta Quadrant. The Kazon are very much like the Klingons of the Alpha Quadrant. In order to receive a name, a Kazon soldier must prove himself in battle. Woman are merely prizes and possessions. The Kazon are a male dominated society, driven to destroy weaker cultures. The Kazon were specifically interested in the Ocampan homeworld since water and supplies were bountiful. Captain Janeway destroyed the Caretaker's Array and Voyager's way home in order to prevent the Kazon from inslaving the Ocampan race. The Kazon did manage to take over Voyager once, under the command of Maj Cullah of the Kazon Nistrim and with the help of Seska. However, Voyager was taken back with the help of Talaxians, Paris, Lon Suder, and the Doctor. It was after this event that Voyager left Kazon space. They have not been seen since. In 2372, Voyager arrived at the Kohl homeworld. What they found was a planet that had been devastated by a natural disaster. However, they detected several lifeform readings under the surface. The lifeforms turned out to be several Kohl survivors who had placed themselves in stasis chambers, knowing about the impending disaster. However, they could not wake them, since their minds were all connected in some kind of program. They later discovered that this program was designed to wake them, but it failed. It turned out that the program was also designed to entertain them, but the program had malfunctioned and a maniacle clown had taken over, and the three survivors feared their life. Voyager was able to rescue them, and shut down the program. In 2371 Tuvok was taken over by an alien race known as the Komar while travelling through a dark-nebula with Commander Chakotay. Tuvok attempted to take Voyager into the heart of the dark-nebula where the Komar reside. Voyager encountered the Krayden in 2374 after Commander Chakotay's shuttle crash-landed on an alien world. On the world, there was a war between the Krayden and the Vori, the Vori being the more hostile of the two. However, the Vori made it appear to Chakotay that the Krayden were the evil and hostile ones, whereas it was the other way around. The Krayden helped Janeway to retrieve Chakotay from the hands of the Vori. Voyager first learned of the Krenim from Kes after she had time travelled in reverse from the moment of her death to the moment of her conception. She warned the crew of a dangerous species who used temporal mechanics as a weapon -- their torpedoes were chroniton based and could pass easily through Voyager's shields. The Krenim had heavily damaged Voyager, and many of the crew were killed. This time period was nicknamed the "Year of Hell" by the survivors. Voyager and the crew did not first encounter the Krenim until 2374. However at first, they were not as powerful as Kes had described. They then changed due to a Krenim, Annorax, who was using a temporal time ship to erase various elements from history in hopes of returning the Krenim Imperium back to its original state. The new Krenim after the alterations were much more powerful and caused considerable damage to Voyager and her crew. Seven of Nine was then able to create temporal shields which did not allow the phasing chroniton torpedoes to pass through Voyager's shields, and this new shield configuration protected Voyager from the alterations in the time-line. Voyager then learned of Annorax and what he was doing, so Janeway decided it was up to Voyager to stop him. In the end, Janeway rammed Voyager into Annorax's ship, causing the time ship to enter real time and the ship was destroyed. This returned the time-line to normal, and the Krenim were no longer a very aggressive and powerful species. Although they did dispute territory with another group of aliens, they were much more peaceful and weaker than they had been. The Ktarian's originate in the Alpha Quadrant and are a member of the Federation. Ensign Samantha Wildman's husband is full Ktarian, and their baby, Naomi Wildman, is half human, and half Ktarian. The visual appearance which marks her as half Ktarian are sharp ridges on her forehead. Voyager encountered the Kyrians in 2374. They were a race who were in a serious dispute with a race known as the Vaskans. Voyager began to communicate with the Kyrians, but the Vaskans took this as an act of assisting the enemy. The Vaskans then considered Voyager a threat, and a terrorist party transported aboard and stole several components of Voyager technology, including the Doctor's Back-Up Module. In the end, the Kyrian leader killed the leader of the terrorist Vaskan group. Voyager encountered the Malon in 2375 in Void space where they were dumping large amounts of waste into the region, thus killing the void nocturnal aliens. The Malon have a beautiful and prestine planet, and in order to maintain it they must export their industrial waste to non-habited sectors. Malon dump vessels can travel thousands of years in order to find a suitable dumping location. Voyager has encountered the species on numerous occasions, and in one instance, the Malon were trying to recover a lost Voyager probe against Voyager's will. This lead to the construction of the Delta Flyer. Voyager first encountered the Mari in 2374. Voyager's crew were allowed to beam to the surface of the Mari homeworld for rest and relaxation, during which time B'Elanna got slightly angry when a man accidently bumped into her. Later that day, that very man was committed for attacking another man. B'Elanna was then blamed for the murder, since it was believed she had 'bad' thoughts which contaminated the man's head, and caused him to committ the crime. It was then learned that the Mari are a people that have abolished bad and evil thoughts from their mind -- in a sense, they are illegal. Lieutenant Tuvok began to investigate the events, and discovered a black market of evil thoughts which were circulating about the Mari Homeworld... Since the population were banned from bad thoughts, they had resorted to a black market to get their fix. The people who worked in the black market took advantage of Voyager's crew to telepathically take bad thoughts from them, to sell on their market. Tuvok exposed the market, and B'Elanna was released from custody. The Mikhal Travellers are a race of people who do what their name implies -- they explore and travel the galaxy, looking for new races and cultures. Voyager first met the Mikhal Travellers in 2373 on a Mikhal planet. Kes later became involved with one of the Travellers, and the Doctor, who's program had degraded from new subroutines he had added, attempted to kill this Traveller. The Mokra were first encountered in 2372 on an Alsaurian planet. They are a dominating, aggressive species, and are in firm control over the Alsaurians. They resort to violence to control the population, and ensure that the Alsaurians will never revolt against their leaders. In 2372, a Voyager away team transported to an Alsaurian planet to collect a much needed warp core component. The Mokra discovered this and attacked the away team, injuring Captain Janeway, and also taking B'Elanna and Tuvok and holding them in a prison cell. With the help of an Alsaurian man, Caylem, Captain Janeway was able to free her crewmembers. The Moneans, encountered in 2375, are sea dwellers. They discovered a planet entirely composed of water, and thus created an underwater civilization. The technology used to maintain this planet of water was alien in nature, and ancient. Voyager discovered that their industry was causing the planet to lose containment, which meant that the planet was literally falling apart. Tom Paris and the crew recommended an alternative industrial measures, which the Moneans simply ignore. Thus, Tom Paris went against orders and attempted to destroy several of the Monean industrial facilities. He failed, and for his actions, he was demoted to Ensign and confined to the brig for thirty days. In 2372, Voyager first encountered the Nechani. The Nechani are a deeply religious people. During a tour of one of their many temples, Kes left the tour and discovered a mysterious gate. As she approached the gate, she was hit by an energy burst which rendered her un-conscious. In order to save her, Janeway had to go through one of the Nechani's purification rite. In the end, Janeway succeeded and saved Kes. However, Captain Janeway began to question the line between religion, and science. In 2373, a Nezu planet was bombarded by a series of asteroids. Voyager attempted to help the Nezu by destroying the asteroids, but each time they did, the asteroids would shatter instead of being incinerating. The bits of asteroid then impacted upon the planet and caused considerable damage. It was later discovered that another species was sending these asteroids in an attempt to scatter the inhabitants, making a take-over of their world much easier. Voyager stopped the alien threat, and the Nezu were able to return to their world. In 2371, Voyager had dealings with the Benaens, a race who were at war with the hostile Numeri. After Paris had been committed of a murder that he didn't commit (which was fabricated by the Numeri to get secret plans off of Benaen to Numeri), the Numeri would not allow Voyager to enter Benaen/Numeri space. When Voyager did enter their space, they attacked a Shuttle commanded by Paris and Harry, which was a trap orchestrated by Tuvok to determine if the Numeri were really responsible for the death of Benaen scientist Tolen Ren. In 2373, the Nyrians attempted to take-over Voyager with an elaborate centerfuge. First, the Nyrians would arrive on Voyager innocently, claiming it was some sort of accident. However, each time a Nyrian arrived, one of Voyager's crew disappeared. After several hours, Captain Janeway realized what was going on, but it was too late. The crew were transferred to a Nyrian prison ship where they were contained in an artificial world, using technology similar to Voyager's Holodeck. With the help of another alien trapped aboard the Nyrian ship, Captain Janeway and her crew were able to escape from their habitat, and turn the tables on the Nyrians. The Nyrians use this technique to steal other species ships. They are highly sensitive to bright light, and cold temperatures. The Ocampans were one of the first races that Voyager encountered upon arriving in the Delta Quadrant. They are a peaceful race, a race which relied on the Caretaker to provide them with power. Many years before, the Nacene (Caretaker) damaged the Ocampan atmosphere beyond repair. As a result, the Ocampans were sent underground to live, and one Caretaker was to look after the Ocampans. However, after the death of the Caretaker, he had only supplied enough energy for five years to the Ocampans. After which, they would have to return to the surface for the first time in centuries. The Ocampans have a very short lifespan, which is between nine and twelve years. This in itself keeps the population levels down. However, the Ocampans can only have one child (a time called the Elogium). In some strange circumstances, an Ocampan woman can experience two Elogiums. During the Elogium, the woman carries the child on her back, and she must have her feet rubbed by her father. Her hands then produce a mucous substance which will lock her and her mate together for a long period of time, to ensure conception. Minor Telepathic abilities are another feature of the Ocampans. The Ocampans use these telepathic abilities to communicate mentally, rather than verbally. Kes was one of the few Ocampans who actually managed to leave the underground, and reach the surface through one of the ancient tunnels which were originally built to bring the Ocampans underground. In 2372, Voyager encountered a second array, and many Ocampans inhabited this array. They had much developed telepathic abilities, and the Caretaker's mate, Sesperia, looked after these Ocampans. This species, encountered in 2376, believed that a holographic program, "Dr. Chaotica", was real and of this reality. Had a photonic origin. The Pralor were first encountered in 2372. They are a race of robots which were created many years before by what they called the "creators". B'Elanna helped to repair one of the Pralor units. However, he soon kidnapped B'Elanna with the hope that she could somehow duplicate a new Pralor unit. The Pralor were unable to duplicate new units due to a secuity mechanism created by the "creators". B'Elanna managed to create a prototype, but later destroyed it to not alter the prime directive and balance of power between the Pralor and Cravic, since the two species of robot units were at war. B'Elanna believed that the Pralor and Cravic would soon annihilate one another, since neither side could manufacture new units. This cytoplasmic species was encountered in 2375. Voyager responded to a distress signal from one of their vessels, and upon transporting the lone injured crewmember to sickbay, it attached itself to Lieutenant Torres and began to use her body in order to survive. In order to remove the organism, the Doctor used a Cardassian medical program of Dr. Macet to use his expertise to remove the organism. The species later returned to retrieve the injured species. Voyager was unable to communicate with them, due to their advanced communication abilities. The Q are a powerful race of omnipotents that the Federation first encountered in 2364. The Q can use their incredible powers to accomplish almost anything. The first Q ever encountered (seen above) has often demonstrated childish behavior, and often taunts other races. The Q were responsible for carrying the Enterprise-D to system J-25 in 2365 when they first encountered to Borg. The Q also put humanity on trail in 2364 for barbaric behavior. Voyager first encountered the Q in 2372 when Voyager encountered a comet with a Q trapped inside. It was later determined that this Q was imprisioned in the comet since he was attempted to commit suicide, something which no Q has ever done. The Q seen above was then sent to Voyager to retrieve this Q. However, Captain Janeway decided a trail was a necessary course of action to determine if the Q had the right to commit suicide or not. During the trial, Q even took some of Voyager's senior staff to the the Q Continuum. In order to be able to perceive it, it appeared to be a gas station in the middle of a desert. In attempting to bribe Captain Janeway into not letting the Q be allowed to commit suicide, the other Q offered to send Voyager home. At the end of the trial, it was decided that the Q had the freedom to do what he pleased to. Janeway urged him to stay on board Voyager, and he agreed. He enlisted as a crew member under the name of Quinn, however, he was found dead shortly after due to a drug that was provided by the other Q.
Voyager again encountered the Q in 2373 when Q wanted Janeway to mate with him to create the first ever Q/Human baby. Janeway refused, but Q claimed that this course of action was necessary to bring stabilization to the Continuum (which was in Civil War) after the events with Quinn. In the end, Q mated with his old mate, and created a child, which brought peace to the continuum. In 2372 a Cardassian missile from the Alpha Quadrant was on a collision course with the Rakosan homeworld. The Rakosan's attempted to stop it with their limited fire-power, but it was the work of B'Elanna Torres who was able to detonate the missile before it collided with the Rakosan homeworld. Although the Romulan empire is located in the distant Alpha Quadrant, Voyager has had dealings with Romulans on two separate occasions. In 2371 Voyager located a very small wormhole. After sending a buoy into the wormhole to scan the other side, Voyager located a ship, which turned out to be Romulan. After trying to convince the Romulan to communicate with Starfleet command to tell them of Voyager's situation, the Romulan finally agreed, but wanted to transport over to Voyager. However, it was determined that the wormhole was also a vortex in the time continuum in that the Romulan was in the past. Upon arrival to Voyager, Tuvok determined that the Romulan Commander had died before Voyager left DS9 in 2371, the date Captain Janeway wanted the messages to be delivered to Starfleet. Since then it has been determined from communicating with Starfleet by way of the Hirogen arrays in 2374 that the messages were never delivered by the Romulan. In 2374 Voyager (more specifically the Doctor) encountered the Romulans again. The Doctor's program was sent by way of the Hirogen arrays to the Alpha Quadrant where the materialized on board the prototype ship, the USS Prometheus, which had been taken over by Romulans. With the help of the new EMH program, the Doctor was able to retake the Prometheus from the Romulans and pass on the message to Starfleet that Voyager and her crew were alright in the Delta Quadrant. The Sakarians were first encountered in 2373 on what the crew believed to be an abandoned planet. Torres, Paris and Neelix had transported down after detecting a source of a very rare mineral which would be beneficial to the crew. They later met the Sakarians who live underground after fleeing from the surface, fearing to be attacked by the Borg again. It was this encounter that made Captain Janeway grow apprehensive about the space ahead of them, fearing an encounter with the Borg. One of the first holographic lifeforms like the Doctor was a Sanitation program which was encountered alone on a ship in 2374. At first, the program claimed that the crew had all died due to a ship malfunction. However, the crew later discovered that the program was unstable and had killed his masters himself. B'Elanna Torres managed to overload the program by using a power conducting cable. The Sikarians were a friendly, outgoing species who first encountered in 2371. They allowed the crew to come and enjoy shore leave on their lush planet. Harry Kim became quite excited when the discovered that the Sikarians had a very beneficial technology which folded space, and allowed one to transport great distances at one time. However, the head Sikarians were not willing to give up the technology, adopting a similar policy to the Federation Prime Directive. However, there were certain individuals who were willing to give up a matrix, in return for Voyager's library of stories; the Sikarians loved stories, and Voyager's database who be a source of elaborate and new stories. B'Elanna, Seska, Carey and Tuvok were involved in the trade, going against a direct order by Captain Janeway. The technology did not work, and when Janeway discovered the truth, each of the officers were reprimanded, Tuvok receiving the more serious punishment. Species 8472, as named by the Borg, were first encountered in 2374. They are an aggressive and hostile race, and were provoked when the Borg infiltrated their fluidic space, which exists in another dimension. Therefore, Species 8472 began their attack on the Borg to ensure that their race and their space would not be polluted by outsiders again. 8472 travel in one man bio-ships, in control by one pilot. The ships are very powerful, and can destroy a Borg cube in several shots. The bio-ships can also share their energy to create a massive weapon, capable of destroying objects such as a planet. 8472 are a highly developed, evolved, intelligent race. Their DNA code is very dense, and the most complicated that the Doctor has ever encountered. 8472 is able to release a type of virus into the bodies of victims, which slowly begans to eat away at the victim; Ensign Harry Kim was infected, and the result was tendrils growing all over his body, and his internal organs were also affected. No drug could stop the process. The massive area which 8472 annihilated all Borg ships was known as the Northwest Passage to the Voyager crew. It was not until they travelled there and detected hundreds of 8472 ships, and also ships arriving through spatial annomalies which 8472 use to travel to our dimension. 8472's real goal was the purge the galaxy. It is unknown where they would have stopped, if they would have stopped at all. That is why Captain Janeway decided to return the balance of power by helping the Borg to defeat 8472. Using Borg nanoprobes, both the Borg and Voyager were able to stop 8472. Several torpedo warheads were equipped with nanoprobes, which were able to attack 8472's ships on a biological level. After destroying nearly 20 bioships, Voyager detected that all 8472 bio-ships were heading back to fluidic space. However, at least one bio-ship was trapped behind. Later that year, Voyager detected a Hirogen ship which was hunting one of Species 8472. They managed to capture it, but it broke loose and killed one of the Hirogen soldiers, and severely injured the other. The surviving Hirogen was taken aboard Voyager, and 8472 also managed to get aboard. Janeway wished to return the injured 8472 to his own space, but Seven refused to help. The Hirogen soldier refused to sit around, wanting to continue his hunt. In the end, he suceeded when Seven of Nine saved the lives of the crew from attacking Hirogen ships by transporting the Hirogen and 8472 to one of the Hirogen ships. In 2374, Voyager again encountered Species 8472 where they had created a holographic recreation of Starfleet headquarters, in an effort to train their operatives to eventually infiltrate Earth and determine any military actions towards Species 8472. They had believed that the Federation were very powerful and were out to destroy their species. They were incorrect, and through diplomacy, Captain Janeway explained that the Federation had no hostile intentions towards 8472, and in fact, Starfleet did not know of their existance (until 2376, thanks to the Pathfinder Project). This lead to peace between Voyager and 8472, and in return, Janeway gave 8472 the specifications for the nanoprobe technology. In the end, both sides learned a little bit more about each other. In 2374 Voyager was attacked by several space pirates which used specialized technology to transport various components of Voyager technology to their ships to be later sold. Some of the technology stolen included Voyager's computer core, and the DaVinci program. Captain Janeway was able to successfully retrieve these items from a neighbouring planet. Steth was an alien who was first encountered in 2374 when his ship, using a co-axial warp drive, came out of warp in front of Voyager. Steth is of an amazing race in that he is able to copy one's DNA and is able to swap appearances with his victims. His victims on board Voyager were Tom Paris and Captain Janeway. Luckily, the Doctor was able to reverse the process. The Swarm were first encountered in 2373. They are a relatively mysterious race, as Voyager has only detected them on this one encounter. They are an insectoid race that "clamp" on to ships, draining their energy. They then transport on board the victims ships. They receive their name due to the fact that they travel in swarms of hundreds of ships. Any amount of energy fired at the Swarm can then be projected back towards the firing ship. The only way Voyager was able to defeat the Swarm was by firing at one ship, destroying it, and since all the ships were connected in a lattice, once one ship was destroyed, others were also. Voyager has not encountered this hostile species since. The Tak Tak were a species that Captain Janeway and Neelix visited to open diplomatic talks for trading purposes. Since the Tak Tak use physical expressions as a way to communicate, when Captain Janeway placed her hands on her hips she offended the Tak Tak diplomats. It took Neelix several hours to explain to the Tak Tak that Captain Janeway was not trying to offend them. A member of the Talaxian race, Neelix, was the first alien that Voyager encountered in the Delta Quadrant. The Talaxians were immediately one of Voyager's allies since they opposed the various factions of Kazon. The Talaxians are a very loyal, and trusting species. They value their family above all else, and celebrate annually Prixin, (celebration of the family). They also have deep spiritual beliefs whereby once one dies, they travel to the Great Forest and meet their deceased friends and family at the Meeting tree. However, the Talaxian race experienced great sorrow after a war with the Haakonians destroyed one of their worlds, Rinax. All of Neelix's family were on Rinax, including his sister, Alixia. The only Talaxians which Voyager has encountered have been traders, but it is known that the Talaxians are also scholars, farmers, scientists. The Talaxians also helped to retake Voyager from the Kazon Nistrim in 2372. Some biological features of the Talaxians are two hearts, two lungs, and a cranial plate suitable for assimilation (as said by Seven of Nine). In 2373, Ensign Harry Kim started to alter biologically into another race. He also experienced these longings for a certain planet, that turned out to be the Taresian homeworld. When Voyager arrived and transported to the surface, they claimed that Harry was indeed a Taresian, not a Human, that had been sent to Earth to live there, and then return to Taresia to tell others of the places he'd been. At first he didn't believe this society which was 90 % women, but his biological changes seemed to be proof. Harry soon learned however, that Taresian woman lure men to their planet so that they can survive. Harry managed to escape, and the Doctor learned that the source of Harry's changes were due to a small virus he had picked up on an away mission several weeks before. The Doctor then changed his biological appearance. It was then hypothesized that these Taresian viruses existed all over the Delta Quadrant, to lure men to their planet. The Think Tank was encountered in 2376. They are a collection of five species which solve dilemnas of other species for a price. They were trying to solve a Hazari paradox for Voyager, in exchange for Seven of Nine. The captain declined the offer, and in the end, Voyager exposed the Think Tank and left them vulnerable to attack by the Hazari. The Trabe were the species which imprisonned the Kazon on their planets, and enslaved them. After the Kazon revolted, the Trabe were scattered and hunted down by the Kazon. Voyager encountered a fleet of Trabe survivors, who were searching for a home world. But, the Kazon were not willing to let them find one, and attacked them each time they attempted to settle on a planet. One of the Trabe then used Janeway's good intentions when she was attempting to create an alliance between the Trabe, Voyager and several Kazon factions to assassinate the Kazon leaders, in order to weaken the Kazon race, and bring the Trabe back into power. The plan backfired, and it is unknown whether the Trabe located a home world to settle upon or not. The Turei were first encountered in 2375 when Voyager accidently entered one of their subspace corridors, and was subsequently attacked. Voyager had to land on the Vaadwaur homeworld to escape their powerful ships. Voyager soon called upon the Turei for assistance in fighting the Vaadwaur, the ancient arch-enemies of the Turei. Voyager managed to escape while the Turei were left to fight the Vaadwaur. Uhnori burial grounds were located on asteroids which Voyager detected in 2371. Voyager believed the asteroids contained a valuable mineral, but were surprised to transport over and see many preserved bodies. Without warning, a temporal vortex opened, and deposited another alien body, but swept Harry away. Harry woke to find himself in another dimension on the Uhnori homeworld. He soon learned that once a Uhnori reaches a certain age, they go through a process whereby they are killed, and their bodies get sent into the other realm, whereas the mind and soul leave the body to be with family members and friends. Harry mananged to get home when he took the place of a man who was to die. 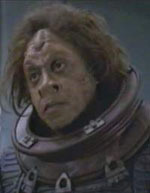 Harry appeared on Voyager dead after a temporal vortex opened. Luckily, the Doctor was able to revive him before it was too late. The Uhnori bodies which had appeared on Voyager were then returned to the Asteroids. First encountered in 2375, a species trying to reach their home, just like Voyager. They lived on a massive Generational ship, with millions of species. Some of the Varo became unhappy on the ship, and rebelled, and tried to separate. Using a virus to detach certain sections of the ship, they managed to escape, and the Varo granted them freedom. The Vaadwaur were first encountered in 2375 when Voyager landed on their destroyed homeworld after escaping attack by the powerful Turei. Voyager had accidently entered one of the Turei subspace corridors, and were then subsequently attacked. The Vaadwaur are an ancient species who were at war with the Turei nearly nine hundred years ago, over the ownership of the subspace corridors. The Turei managed to infiltrate Vaadwaur space, and began to attack the Vaadwaur homeworld, completely destroying all cities, as well as all life that hadn't managed to escape. However, some of the head Vaadwaur escaped to underground chambers, where they entered a cryo-genic sleep for five years. They had planned to re-awaken after this period, and find a new home and rebuild their fallen empire. However, the chamber computers failed, and they remained in stasis for over nine-hundred years. That is when Voyager stumbled upon them. Seven of Nine re-activated one of the stasis tubes, and the Vaadwaur in stasis, a Dr. Gedrin, awoke. Voyager and Gedrin subsequently re-activated the remaining stasis tubes. The Vaadwaur then began for an attack, thus allowing Voyager to escape the planet, and the Turei, and use the subspace corridors to get closer to home. However, Neelix, suspicious of the Vaadwaur, began to investigate their ancient history. In Talaxian history, Vaadwaur means foolish in the old tongue. Upon further research, he discovered that the Vaadwaur were hostile, and invading many worlds. Upon confronting Gedrin, Janeway discovered that the Vaadwaur not only used their corridors for exploration, but also for conquest. The Vaadwaur then turned on Voyager, and with the help of Gedrin and the Turei, Voyager was able to escape the planet. However, sensor logs detected several Vaadwaur vessels that survived the conflict with the Turei, and used the corridors to escape. The Vidiians were first encountered in 2371, when Neelix had his lungs stolen while on an Away mission looking for dilithium deposits. Luckily for Neelix, the Doctor was able to use "holographic lungs" to keep Neelix alive. Captain Janeway then ordered the crew to follow the alien ship, right inside an asteroid. Once inside the asteroid, Voyager, beamed the alien occupants to Voyager. Captain Janeway learned that these Vidiians must harvest other specie's organs to sustain themselves. The Vidiians were almost entirely wiped-out by a fatal plague, called the Phage, which causes their organs to break-down and not function, therefore requiring new organs. Their highly sophisticated medical transport technology makes it quite simple to harvest their victims internal organs. Before the Phage crippled the Vidiian race, they were scholars, civilized and had a rich, defined culture. Although the Vidiians are hostile, they claim it is necessary to keep their race alive. They have scientists working constantly on a cure, and they believed that using B'Elanna's Klingon DNA, they could stop the Phage. In 2371, B'Elanna, Tom and Lieutenant Durst were kidnapped by the Vidiians. A scientist used a specialized device to separate B'Elanna's DNA, and make two individual people--a full human B'Elanna, and a full Klingon B'Elanna. The Scientist then infected the full Klingon B'Elanna with the Phage, and her body fought it. However, the Vidiian Doctor still hadn't found a way to incorporate this into a cure. The Vidiians would be encountered several more times. In 2372, after Voyager was doubled by a spatial annomally, the Vidiians attacked one Voyager and overtook the ship, while the other Voyager survived. The invaded Voyager self-destructed, destroying the Vidiian ship and saving the other Voyager. It is believed that the Vidiian's would not be encountered again, as Voyager has passed through their territory. First encountered in 2375 in the area of space referred to as the void by Voyager's crew. This area was very large, and void of stars/planets/interstellar bodies. These nocturnal aliens lived in this area until the Malon began to dump their toxic waste in their space. To stop this, Voyager destroyed a worm hole leading from the Void space to Malon space, thus cutting of the route and not allowing further dumping by the Malon. The Voth were encountered in 2373, when they were tracking Voyager after following an elaborate trail of breadcrumbs to find Voyager: Hogan's remains on Hanon 3, Voyager's equipment found at the Outpost in the Nekrid Expanse. When they arrived, they transported Chakotay to their ship, while one of the Voth were trapped on Voyager. The Doc analized the Voth, and found common DNA strands in both the Voth and the Humans. After searching, he discovered that the Voth had originated in Earth millions of years ago. The Voth had evolved from dinosaurs, and were able to escape the planet before the fatal asteroid collided with Earth and wiped out the Dinosaurs. The Voth scientist, Gegen, attempted to convince his people of his findings, that the Voth had travelled thousands of light years across the Galaxy to arrive in the Delta Quadrant. However, they were un-willing to accept this, claiming they didn't want to tarnish their highly advanced culture, announcing they were refugees from a distant planet. When Voyager left, they were ordered by the head Voth never to return. Doctor Gegen was to never speak of his evolution theories, but he claimed he would continue to tell his theory until the Voth accept Earth as their true homeworld.